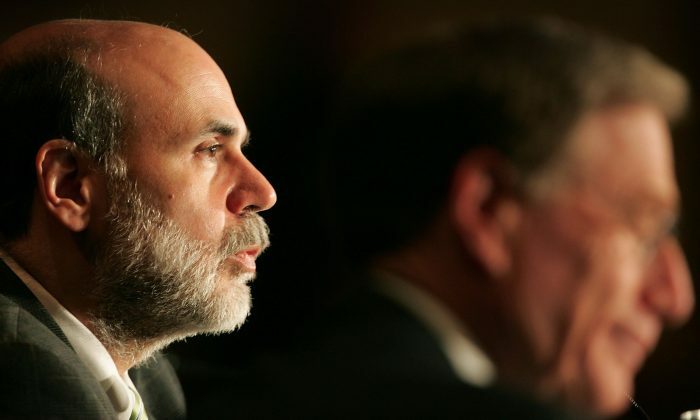 Why Is Bernanke Joining a Chicago Based Hedge Fund? After testing the waters with giving speeches at $200,000 a pop and becoming a fellow (and blogger) at the Brookings institution, former Fed chairman Ben Bernanke decided it was time for something serious. One thing is for sure: Despite only being an advisor, he will make some serious money giving advice to Citadel LLC, a Chicago based hedge fund. Bernanke didn’t really want to tell how much he is going to make, but one can be sure while the hourly wage will be lower than that of his speaking engagements the annual compensation will be higher. Citadel is indeed interesting, because it manages roughly $24 billion in assets across all asset classes. It has a heavy focus on high frequency trading and so called market neutral strategies, which is why its assets including “leverage” or borrowed money are even higher at $176 billion. This is just a classic case of the revolving door principle. Leverage is something Bernanke is used to at the Fed, with total assets in February ($4.5 trillion) and total capital of only $58 billion. However, why else would Bernanke join a Chicago based hedge fund and why does it make sense for Citadel to hire him. Bernanke said he did not want to join a company regulated by the Federal Reserve to avoid conflict of interest. This is admirable, but let’s not kid ourselves. By setting interest rates and buying trillions of Treasurys via its quantitative easing program, Bernanke was dealing in the same markets as Citadel. Sometimes on the same side, sometimes on the other side. For Citadel, which mainly focuses on quantitative and market neutral strategies—Bernanke’s dealings at the Fed were hardly market neutral—, it is unclear what knowledge he can add, other than what he knows about upcoming Fed policy. So despite Bernanke’s assurances—we still haven’t heard from Citadel—this is just a classic case of the revolving door principle. Do some favors to the market while in office and then get your payoff.